Whether or not you’re familiar with Trev Wilkinson’s name, you’ve likely encountered his work in a guitar or bass you’ve played at some point. Whether it was a Wilkinson tremolo system, a Roller Nut, or a set of his pickups, Wilkinson has left his mark on the guitar industry as a prolific and innovative designer of hardware. He expanded into producing his own guitars in the mid-1990s, and since then has been getting major buzz for his unique offerings in Fret-King, and for redefining the price-to-performance ratio with Vintage, his line of guitars inspired by the classics. With Fret-King continuing to grow its presence in North America, we were thrilled to talk with Trev Wilkinson and discover the arc of his career, from designing hardware to getting to stamp his own name on his headstocks. We discovered, not surprisingly that whether working on hardware, a guitar, a bass, a pedal, or even an amp, the player is always at the forefront in Wilkinson’s mind. Cars and guitars go together. Just ask Billy Gibbons. After graduating college, Wilkinson entered the automotive business, where he worked on all manner of cars, including luxury autos like Aston Martins and Ferraris, during the early ’80s. But it was on a Toyota that Wilkinson would stumble upon the idea that led to his guitar breakthrough. “I was rebuilding a Toyota rear wheel bearing when I noticed the needle rollers and I thought, ‘if I could put that in a nut, it could allow the strings to go backwards and forwards — and that tinkering is what led to the Roller Nut,” Wilkinson explained. Fender Stratocaster with Wilkinson Roller Nut. 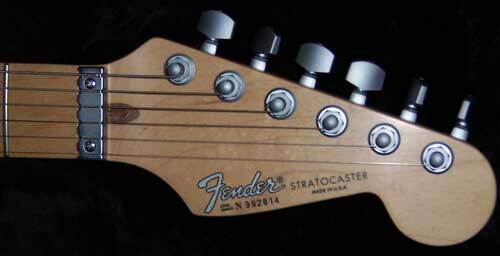 The Roller Nut-equipped Strat Plus was released in 1987. It was a huge win for Wilkinson and his hardware, but his eyes were set on high-profile players. “There were three guitar players I had in my sights: Jeff Beck, Eric Johnson, and Stevie Ray Vaughan,” Wilkinson said. It’s well-known that Beck has been a big fan of the Roller Nut. His initial run of Fender signature models starting in 1990 featured the nut, but the second incarnation of Jeff Beck Stratocasters switched to an LSR Roller Nut in 2001. Still, Beck is often spotted onstage using a Strat with a Wilkinson Roller Nut as his main guitar. Check one for Trev. Before his untimely death in 1990, Stevie Ray Vaughan had shown interest in the Roller Nut after seeing it on Beck’s guitar. According to Wilkinson, however, Fender executives were reluctant to put any new hardware on Vaughan’s signature Stratocaster that fans hadn’t seen him play before, and so the guitar was released in 1992 with a more traditional bone nut. “I built two gold Roller Nuts for Stevie’s prototypes and he said ‘that’s the way I want it to go’ and then a couple of day’s later the poor guy’s gone,” Wilkinson said. Another one of Wilkinson’s guitar idols, Eric Johnson, was intrigued by the Roller nut, but was hesitant to adopt the it on his guitar. In the years to come, Wilkinson would become a known name among guitarists for all manner of parts and components: from tuners to pickups and vibrato systems. Wilkinson even worked with mechanics to develop the ADT Self-Tuning Bridge, a mechanical self-tuning device that debuted in his Fret-King Super-Matic guitar in 2010. Other manufacturers adopted Wilkinson parts for their guitars and many players upgraded their own guitars with Wilkinson hardware. Even in the early days, Wilkinson would explore beyond guitars. In the mid-1990s, he and neighbor Don Morris (who worked with Yamaha at the time) collaborated on Electroplex amps with the goal of achieving a high-headroom amp that could achieve lush overdrive at any volume and complement both single-coil pickups and humbuckers. Though Wilkinson left the company in 1995 upon moving back to the UK, Electroplex has carried on and the boutique amps have earned impressive reviews in the likes of Premier Guitar. 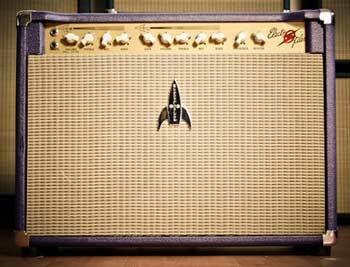 The Electroplex Rocket 22 combo amp. The reason Wilkinson moved back across the pond? In part, to start crafting his own line of guitars. Wilkinson started Fret-King in the mid 1990s while still residing in the US, bringing five prototypes to NAMM in 1995 and secured orders from dealers. Unfortunately, initial sales didn’t live up to what Wilkinson hoped for, as dealers were reporting light interest from shoppers. Establishing Fret-King as a new brand would prove challenging, but there were some breakthroughs in those early days as well. Wilkinson recalled one such moment in 1999, when guitarist Page Hamilton walked into a New York guitar shop which carried Fret-King and walked out with an Esprit 5. Hamilton was on tour in David Bowie’s band on his “The Hours…” tour, and the Esprit was played on British television. Though Hamilton didn’t turn into a Fret-King endorsee, the company’s artist lineup today includes endorsees from all manner of genres including blues rock, punk and hip-hop. Fret-King’s latest signature model, the John Jorgensen “JJ” embodies Wilkinson’s ethos of making guitars for players. To solve Jorgensen’s desire of true single coil tone married with completely hum-free performance, the guitar’s two single-coil pickups are paired with “ghost coils” inside the guitar to cancel out hum without coloring the tone. Wilkinson is so willing to tinker — with pickups, hardware, tonewoods and construction — because he recognizes that each guitar serves its own purpose and is suited to a certain kind of player. Another major breakthrough for Fret-King was Wilkinson’s partnership with JHS, a UK-based musical distributor. Adding Fret-King as a high-dollar brand to complement its other guitar lines, JHS helped Wilkinson’s guitars get even more exposure in the across the UK as well at the U.S. The line of products has expanded as well, with Wilkinson designing his own pedals under the Fret-King label. 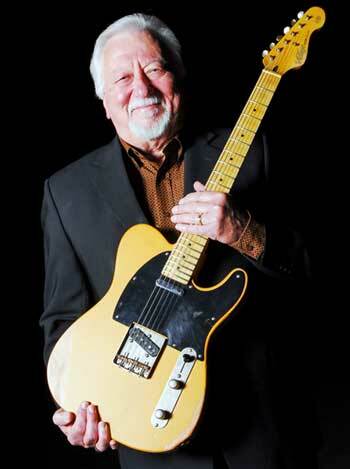 Nashville guitarist Jimmy Capps holds his Vintage V52. Just as Fret-King is making the most of its artist endorsements and word-of-mouth testimonials to grow, Vintage, another line of guitars by Wilkinson, is doing the same. The Vintage V52, a take on a classic Telecaster, has been making the rounds at one of America’s most-famed musical institutions, The Grand Ole Opry. UK-born guitarist Michael Spriggs, who now performs in Nashville, has spread the word about his V52 at the Opry, and several fellow session guitarists have picked up the bargain-priced guitar. The impressive list of V52 slingers in Nashville now includes session guitarists like Jimmy Capps, who played on George Jones’ “He Stopped Loving Her Today” and Kenny Rogers’ “The Gambler,” and Duane Allen, who has performed with the Oak Ridge Boys, Reba McEntire and Garth Brooks, among many others. The endorsements have helped Vintage make a name for itself in the States — after all, is there a more perfect institution to get behind your ’52 Telecaster-inspired guitar than the Grand Ole Opry? Wilkinson’s work with Fender didn’t end with the Strat Plus. Shortly after moving to California, he met Leo Fender, who at the time was designing guitars for G&L, a company he founded along with George Fullerton in the mid 1970s. Wilkinson’s factory was a short drive from G&L’s, and the two met after Wilkinson showed Fender his Roller Nut. Fender, who was introducing several innovations to his guitars at G&L, was impressed, but no deal over the nut was reached. The two would still become friends, with Fender taking on a sort of mentor role with Wilkinson. Wilkinson got to know Leo Fender during the twilight of his career, discovering how much pride he placed in his G&L instruments. 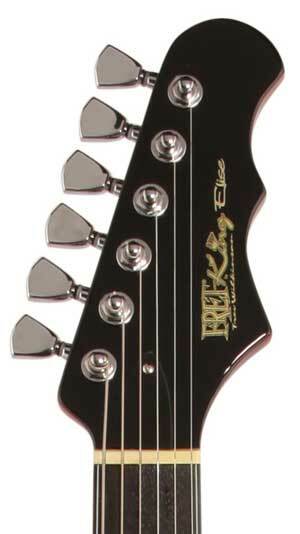 The Fret-King Elise headstock features six-in-line tuners and straight string pull. 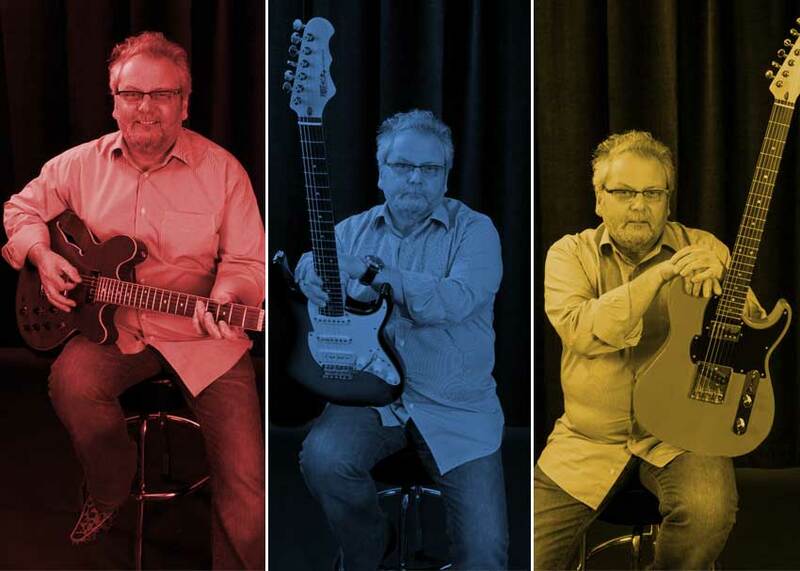 As a builder, the real value in knowing Fender, Wilkinson says, was understanding the thinking behind some of his most groundbreaking decisions. For example, he learned that Fender designed his headstocks with straight string pull because it helped with tuning stability. Perhaps Wilkinson considered that knowledge when designing so many Fret-King headstocks with six-in-line tuners for straight string pull? Not all of Fender’s decisions were intentional, however: Wilkinson explained that the reason Fender made his guitar bodies 1 3/4″ was because the wood available at the lumberyard was 2″ thick and after planing it down, it was 1 3/4″ thick. Wilkinson was with Fender on the afternoon of the night he passed away. He says that on that day, Fender was showing him his last guitar design — a short-scale six-string, bass guitar that Wilkinson said was similar to today’s Fender Bass VI. “He was a great mentor and I was privileged to know him.,” Wilkinson said.